Despite the snow and rain that has been thrown at them, the chives in my garden have grown with gusto this spring. They have a fresh, punchy flavour, which is delicious when coupled with a mature British cheese, like cheddar. 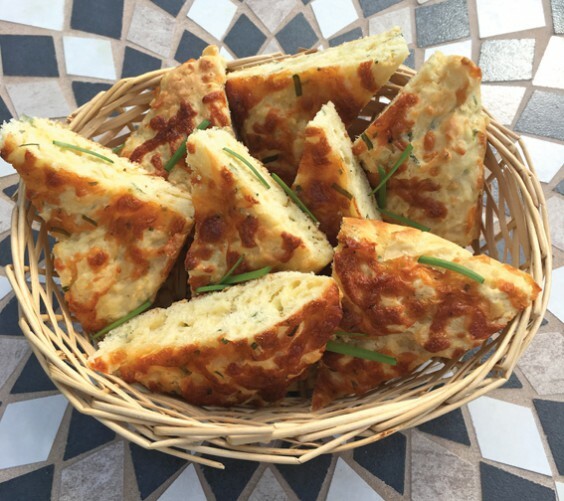 This “bread” is actually made from a savoury scone dough, so it’s easy and quick to make, with no yeast or rising time. It is delicious served as part of a ploughman’s lunch, with a beer on the side. 1) Heat your oven to 190C / 170C fan / Gas 5, and butter and line a 23cm square cake tin. 2) Sieve the flour and salt into your mixing bowl. 3) Reserving 3 tbsp of the grated cheese, stir remaining cheese and chives into dry ingredients. 4) Mix together the beaten egg, melted butter, milk and mustard. Stir these wet ingredients into the dry ingredients and mix thoroughly. 5) Pour the mixture into the prepared tin, smooth with a palette knife and then sprinkle over the reserved cheese. 6) Bake in the preheated oven for 30 mins, until golden brown and springy to the touch. 7) Leave in the tin for 10 mins, before turning on to a wire rack to cool. Slice into 8 triangles to serve.